Have you seen Cold Comfort Farm? Or read it? If you haven’t you should. Read and see it, both versions are brilliant. No idea why fritters for lunch made me think of it but I must haul the DVD out for my regular viewing. I whipped these little fritters up in pretty much the time it would have taken to slap sandwiches together. Yummy scrummy little fritters. The kids were ecstatic as they are at anything that vaguely resembles a pancake and not a scrap was leftover. You could top them with goat cheese if you wanted to be all fancy. Mix it all together. 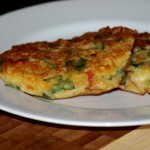 Heat a little butter and tablespoon of oil in a frying pan and fry up pikelet sized fritters until golden on each side. oh my, corned beef fritters, that take me back. Yumbo. 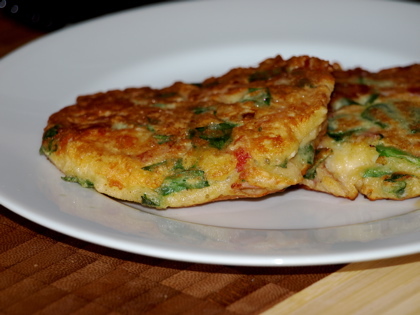 You’ve got to love something as versatile as a fritter don’t you? The perfect vehicle for scrappy leftovers.